BEIJING — China responded Monday to calls that it needs to do more to rein in North Korea's nuclear program by saying that American officials were truly to blame for inciting conflict on the Korean Peninsula. The detection Friday of North Korea's fifth nuclear test brought new pressure on China, Pyongyang's economic lifeline and the closest thing it has to a political ally. U.S. Defense Secretary Ash Carter said China had an "important responsibility" in North Korea. But Chinese Foreign Ministry spokeswoman Hua Chunying told reporters Monday that Carter was "being too modest." She cited a Chinese saying — "Whoever started the trouble should end it" — in calling on the U.S. to "take on its due responsibility." "I think the U.S. should go over the process of the development of the nuclear issue and earnestly work on a tangible and effective resolution," Hua said. China has agreed to allow sanctions at the U.N. Security Council after previous tests by Pyongyang, and says it has restricted shipments of jet fuel and imports of certain minerals from North Korea, which otherwise remains in almost total isolation from the world. 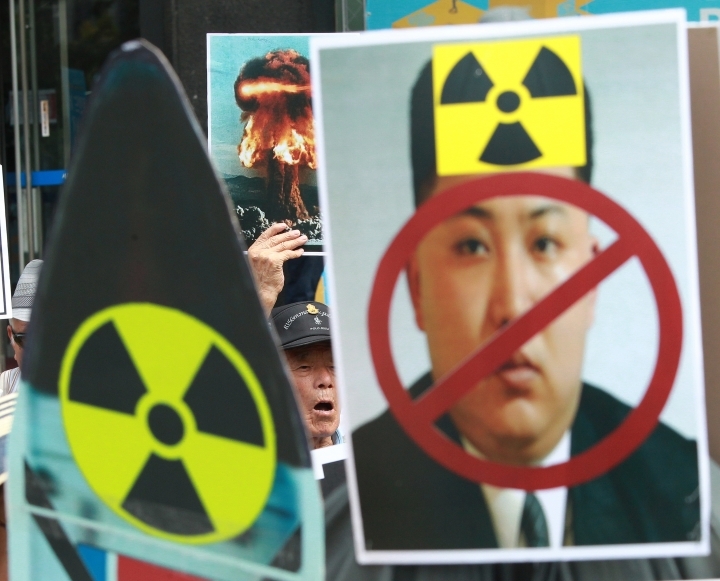 Critics, however, say China hasn't done enough to tighten economic pressure on North Korea as punishment for its nuclear tests, which the Chinese government has publicly opposed. Since Friday, Chinese state media have repeatedly linked North Korea's latest nuclear test to the American deployment of a high-altitude missile defense system in South Korea, which China has long opposed. Hua did not mention the missile defense system, known as THAAD, on Monday. But she said all sides needed to resolve their concerns in a "balanced way." Even if China wanted to rein in North Korea, analysts say it's not clear that it could. North Korea has repeatedly rejected China's entreaties not to test nuclear warheads, and Pyongyang officials appear to be exploiting tensions between China and South Korea over THAAD, said Tong Zhao, an associate at the Carnegie-Tsinghua Center think tank. "Beijing apparently has very little real leverage," Zhao said in an email. One possibility is that China could try to broker a deal to freeze North Korea's development of new missiles and warheads as part of the U.S. and South Korea suspending joint military exercises, Tong said. But Adam Mount, a senior fellow at the Washington-based Center for American Progress, said China has more leverage, and more reason to act, than its officials sometimes make it seem publicly. "More and more, China treats North Korea as a threat to its national security and regional stability," Mount said. "Encouraging this transition should be at the top of the next (American) president's agenda with China."